In need of an ultra-luxe treat? Arabian Oud Body Oil is our latest offering. Our deeply therapeutic Arabian Oud Body Oil unfolds like a silk damask of precious Middle Eastern ingredients: Oud Wood, Frankincense, Sandalwood and Rose. The gloriously rich and aged complexity that makes Oud the most prized wood in aromatherapy is complemented by the grounding aromas of Frankincense and Sandalwood and delicately calming Rose. These are blended with the highest quality cold pressed botanical oils usually reserved for opulent face-only formulas. These are macadamia, almond, apricot kernel and jojoba. This exquisitely indulgent fusion of exotic essential oils combines to create an impossibly deluxe body treatment. Its distinctly sophisticated aroma is bold and rich, yet not overpowering. Ultra-hydrating and full of nourishing essential minerals and antioxidants, this extraordinary Body Oil will envelop the wearer in warmth. 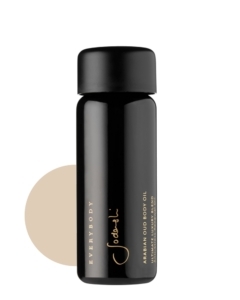 Sinking in quickly, this Body Oil leaves the skin incredibly soft and silky. Designed to be as opulent and luxurious as possible, apply Arabian Oud Body Oil to slightly damp skin after bathing or showering for best results. It also makes for a beyond-indulgent, ultra-moisturising bath oil, and a nourishing hair treatment. But the benefits are so much more than skin deep. The rarest and most sacred oil on the planet, Oud has a profound ability to release stored emotions. It deeply calms and soothes the nervous system, making it the perfect tonic for tiredness and stress, bringing about a deep sense of renewal. For centuries monks have used its wonderfully deep and luscious aroma to boost devotion in meditation; it brings stillness, focus and clarity to the mind, and invokes a sense of strength and peace. Arabian Oud Body Oil is a core element in the Sodashi Oud Renewal Therapy available at CHI, The Spa at Shangri-La Hotel Sydney. A truly unique 90-minute treatment, it works on both the body and face to deliver incredible results in terms of released muscular tension, improved digestion, detoxification and skin radiance. It provides an indulgent head-to-toe experience. The benefits of this exceptional treatment extend far beyond the physical, having profound effects on the emotional, energetic and spiritual wellbeing.